Currently, app markets are silos. Android, iOS, Amazon, and Windows all have their own offering. However, it appears that developers are beginning to look for alternatives to the usual suspects. CodeNgo reported a recent study from Research2Guidance (titled "Smartphone App Market 2013") suggests there is a growing distribution in mobile app stores. Though in the report it was predicted the app store model will likely remain as the primary distribution channel for mobile apps for the foreseeable future, there is evidence to suggest things are changing. Some developers are beginning to make their apps available outside the Google Play Store and Apple's App Store, and there is value in this strategy. The Chinese web services company Baidu recently purchased the Android app distributor 91 Wireless for $1.9 billion. The Google Play store is not currently available in China, so alternative distribution channels have a lot of value. App store distribution. Image courtesy of CodeNgo and Research2Guidance. If the growing number of apps means a greater number of "app stores," it will be harder for developers to create cross-platform software. Developers already struggle to retain interest in Windows Phone, so the there is a possibility many emerging app markets will be demographic specific - with some focusing on enterprise or business over average consumers. We all love free apps, but they often come with a different price... ads. While these ads are the bane of some people's existence, a recent study shows that most mobile users are fine with it. Flurry Analytics reports that there is a trend toward more free apps. 80 percent of apps were free in 2011; that number has jumped to 90 percent today. Some might argue that this supports the idea that “content wants to be free”. We don’t see it quite that way. Instead, we simply see this as the outcome of consumer choice: people want free content more than they want to avoid ads or to have the absolute highest quality content possible. This is a collective choice that could have played out differently and could still in particular contexts (e.g., enterprise apps or highly specialized apps such as those tracking medical or financial information). 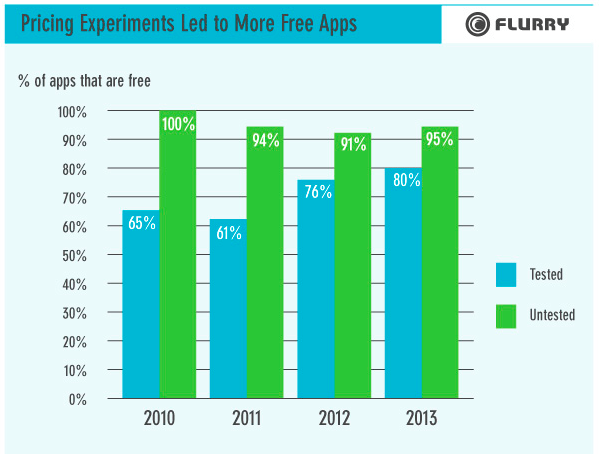 Flurry shows that the percentage of free apps is increasing. Flurry has taken the majority of its data from the Apple App Store because it has been in operation longer than Google's Play Store. The average price of apps between app stores was also examined. Not surprisingly, iPad apps tend to be the most expensive. On average, iPad apps are $0.50; compare this to average iPhone app at $0.19, and average Google Play app at $0.06. There is a considerable gap here. Conventional wisdom (backed by a variety of non-Flurry surveys) is that Android users tend to be less affluent and less willing to pay for things than iOS users. Does the app pricing data support that theory? Resoundingly. As of April 2013, the average price paid for Android apps (including those where the price was free) was significantly less than for iPhone and iPad apps as shown below. This suggests that Android owners want app content to be free even more than iOS device users, implying that Android users are more tolerant of in-app advertising to subsidize the cost of developing apps. Flurry is careful to point out that this trend toward free apps is no coincidence. It's driven by data. Looking at the App Store, Flurry was able to identify apps that have gone through pricing experiments - using A/B testing, or looking at apps that have raised and lowered their price over time. The chart below decribes this. "Green" apps were always free, but the "Blue" apps started out as paid and eventually became free. As shown, there was an upward trend in the proportion of price-tested apps that went from paid to free. This implies that many of the developers who ran pricing experiments concluded that charging even $.99 significantly reduced demand for their apps. Flurry thinks the conversation should change from "paid apps vs. add supported apps," to "how do we make ad supported apps more interesting and appealing to consumers. The report is really quite fascinating. Check out Flurry's full report and Venture Beat's coverage below. Tablet apps are an increasing interest for developers. The iPad already supports over 375 thousand tablet optimized apps, and Android and Windows are beginning to pick up speed. A recent ABI research report suggests the tablet app market is becoming increasingly more lucrative. In an App Accelerator Survey, 84% of the 6,046 app developers polled planned to make a smartphone app in six months, and 81% planned to make a tablet app. Also, there is a big shift toward enterprise apps. In Q4 2010, 70.7% of polled developers said they were focusing on or developing a consumer app. In Q2 2013 that number fell to 57.2%. Conversely, in Q4 2010 29.34% of developers were focusing on or developing enterprise apps. In Q2 2013, that number grew to 42.7%. The report also hints at the possibility of there being a third major player in the mobile space. There is also much interest in cross platform apps; 90% of surveyed developers said they write apps for multiple OS'. Check out the aforementioned reports in the sources below. According to Sarah Rotman Epps, the app battles that have taken place on the smartphone and the tablet front are moving to another frontier. Ever since Apple launched its App Store in 2008, platforms have waged war on each other to attract the most app developers. In smartphones, iPhone and Android have pulled far ahead while competing platforms like Windows Phone and BlackBerry have lagged behind. On tablets, iPad beats any other competitor by hundreds of thousands of apps. But now, the app wars are battling on a new front: Wearables. Nike Fuel Band: CC Image courtesy of William Hook on Flickr. Wearables are generally defined as devices that pair (or connect to) one's current smartphone (typically via bluetooth) to augment the user's experience. These devices are used for gathering health information (in the case of Nike's Fuel Band), taking photographs and videos (Google Glass), or pushing notifications (Pebble Watch). In quarter one 2013, 4,673 US adults were surveyed in a Forrester Research survey. 6% said they wore some sort of wearable technology, and 5% said they used a wearable device to monitor their activity. 6% is equal to approximately 11 million people. Yet, Epps thinks the market could be considerably bigger. In the same survey, consumers indicated interest in a wide range of uses for wearables beyond health and fitness. For example, 44% said they’d be interested in a device that could unlock their car and house so they wouldn’t have to carry keys. 30% said they’d like a device to make media recommendations based on their mood. And 29% said they’d be interested in using a device to track their child’s activity. All of these scenarios and more are possible with today's technology. While there are many form factors for wearbles, Epps feels that the heads up display has the greatest potential. There’s a lot you can do with a wristband, as Jawbone and Nike are demonstrating, but there’s even more you can do with a heads-up display. Google Glass is the most disruptive and compelling competitor in the app wars today, attracting developers from top-tier media brands (CNN, The New York Times), social networks (Facebook, Twitter, Path, Tumblr), as well as independent developers like Lance Nanek. Ultimately consumers will be the winners in the long run, as more apps will result in greater utility and longevity in the wearables we buy. Matt Asay, of Read Write, predicts Android will be the preferred home for open source developers in the future. According to data from Black Duck software, "new Android-related mobile open-source projects outstripped open source iOS projects by a factor of four in 2012, growing by more than 96% each year since 2007. New iOS project growth, on the other hand, was just 32% from 2011 to 2012." Developers have historically favoured Apple's iOS due to its superior developer tools and monetization. This shift toward Android should be concerning to Apple, as it might suggest open-source developers are beginning to view Android as a better platform for launching new innovative apps. Check out Matt Asay's article below. ​The need for a new file system-like app for iOS. iOS 7 and my continued, unrequited desire for a Files.app! Every year, for the last three years, I've asked Apple to consider what amounts to a Files.app and FilePicker control in iOS. It would be analogous to the Photos.app and ImagePicker control, but allow us to easily find, and easily open, all the documents we use on all our iPhones and iPads, every day. Now, on the eve of iOS 7, the need for better file handling -- not filesystem! -- remains, and if anything has become even more urgent.